-The Friars needed that win…big time! -One game after I called Coach Cooley an NTCF faithful, he turns his back on me and reverts back to the same starting 5 he’s gone with recently: Council, Cotton, Fortune, Henton, Batts. Although I don’t want to admit it, his move was justified considering in 17 minutes Harlem’s favorite big man Sidiki Johnson only managed to score 1 point and grab 2 boards. -Vincent Council is shaking the rust off, and I love it. Council looked more like the 2011-2012 version of himself than we have seen thus far in 2012-2013. Council’s shot still isn’t there (he went 4-12 from the floor), but he controlled the game completely. In his 35 minutes of play, Council directed the offense, moved the ball, and consistently found the open guy. His improved play led to a solid stat line for the first time in a while: 11 points, 8 dimes, 3 boards, 2 steals, 2 blocks, and my favorite number of the night 2 turnovers. -In 15 minutes of play, Kris Dunn had 0 assists. After the Colgate game, where Dunn dropped 13 dimes on America’s whitest team, he was being proclaimed as the next coming of God Shammgod. Four games into Big East play and I think the expectations from Friar Nation have been tempered a bit. I understand Coach Cooley’s reluctance to take Cotton and Council off of the floor against Seton Hall, but Kris Dunn just doesn’t look fluid at the 3. He doesn’t really have the size to play there in the Big East (he is only 6’3″), and he has yet to find enough rhythm offensively to provide consistent offense. He moved without the ball a little better against the Pirates. But, I’d love to see Dunn get a little more time at point and see Council work a little more off of the ball. -I know I’m stating the obvious, but I feel it needs to be said (again): Brice Kofane is completely inept offensively. -LaDontae Henton is so left-hand-reliant it’s sickening. I’m pretty sure when I was playing middle school basketball, our coach was constantly forcing us to dribble with our off hand. Did LaDontae call out sick those days? Last year, the left hand may have been a bit deceptive for the opposition. This year, LaDontae is good for getting the s**t blocked out of his shot at least 3 or 4 times a game. Switch it up a bit my man. Let’s try a fake left and a baby hook to the right. He’s so predictable, it’s ridiculous. 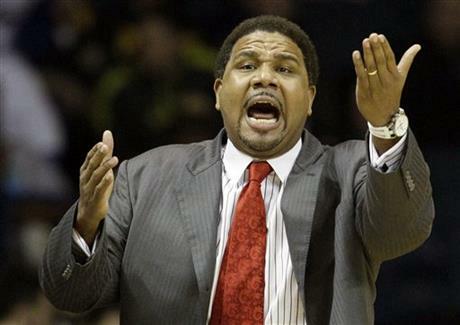 -The Friars showed the defensive intensity that they have lacked thus far in Big East play. PC forced Seton Hall into 17 turnovers. The Friars are not skilled enough offensively to outscore many teams in the Big East (barring a jaw-dropping performance from Ice Cotton), so they need to win games on defensive. Using the despised smaller lineup, they SHOULD force teams into more turnovers and utilize their speed in transition. I’m hoping the Friars show similar effort against one of the country’s best defensive teams in Georgetown on Wednesday.